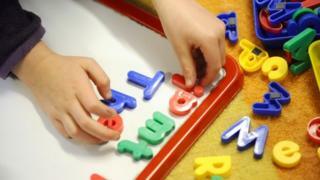 Teachers have voted to ballot for a boycott on tests for four-year-olds in England, calling them "disgraceful". Delegates at the National Union of Teachers' conference backed a campaign to abolish the tests which are coming to many schools in September. Teachers warn the literacy and numeracy tests would stress young pupils. Schools minister Nick Gibb said it was "extraordinary" that teachers' unions could not say "a single positive thing about England's schools". These "baseline tests" in reading, writing and maths, to be carried out when pupils begin school, are intended to provide a starting point to measure progress against through primary school. Ministers have argued that the assessments will help to make sure pupils leave primary school having made good progress in these basic skills. The Labour party also supports the introduction of the baseline tests for reception pupils. The Liberal Democrats support the tests and reject the way they have been characterised at the teachers' union conference. But Sara Tomlinson, calling for a boycott at the NUT annual conference in Harrogate, said: "We actually have the chance to stop these tests. We need to step up this campaign and act promptly as a trade union. Making an emotional plea against the tests she said: "Four is too young to test," adding that experts had denounced the tests. "We have seen the reports on child mental health. What we are doing to children is absolutely disgraceful." She described the situation in her school where children were tested so frequently it was like "death by testing". The tests would be used by the Department for Education to track how much progress a child had made, she said, claiming that this would be used to decide whether the child's teacher gets a pay rise or goes into a capability procedure. Alex Kenny, a union executive member, said the NUT was not opposed in principle to assessing children, but it opposed these baseline tests and how they will be used. The tests are being introduced formally in September 2016 but schools are being invited to start the testing early this September. Schools and teachers will be encouraged by the NUT to opt out of these. The motion called for the union's executive to take action, including "work towards a boycott of baseline assessments as the first step in undermining the basis of testing in primary schools". NUT deputy general secretary John Dixon said a ballot on a boycott would be a last resort, which would follow a campaign of persuasion. Michael Davern, a teacher from Southwark, said members should "sink the ship before it sails" and urged parents to join in any boycott and opt out of testing. Christine Blower, NUT general secretary said: "Government policy for primary education is on the wrong track. Unless challenged by teachers, it will give pupils a narrow and demotivating education, ill-fitting them for later life. "Nowhere is this clearer than in the baseline assessment. Testing four and five year olds has nothing to do with supporting their learning, and everything to do with reinforcing a system which oppresses children and teachers alike with its narrow and rigidly-policed demands." The opposition to the tests was supported by the Pre-school Learning Alliance, with chief executive Neil Leitch saying the early years organisation "fully supports" the union's decision. "Early years policy must always, without exception, have the needs of the child at its centre - but with baseline tests, this is simply not the case," said Mr Leitch, who warned that he remained "extremely concerned that the proposed tests focus so heavily on the narrow skills of language, literacy and numeracy". But the NUT's stance was attacked for being relentlessly negative by school reform minister Nick Gibb - who accused the teachers' union of being unwilling to say anything positive about schools. "Just like the Labour party, all they have done is undermine the hard work of classroom teachers, which has seen a million more pupils in good or outstanding schools since 2010, a 71% increase in students taking rigorous academic subjects and 100,000 six year olds reading more confidently," said Mr Gibb. "It's abundantly clear that the gulf between the leadership of the unions and their members has never been greater." A Liberal Democrat spokesman said the party supported the introduction of baseline tests, but rejected how they had been portrayed in the NUT debate. The tests would allow "proper credit to schools, often in disadvantaged areas, whose pupils achieve outstanding rates of progress while at the school". "There is absolutely no question of putting four and five year olds through the kind of formal testing that is used for older children - that would be completely inappropriate and not something Liberal Democrats could ever support. "However, parents expect every teacher to understand the individual needs of their child and to be confident their child is progressing. That's why thousands of schools already do a simple check up when children first arrive in the classroom."